Silvio Berlusconi is drag queen by John Dahl. The intended metaphor can be reconstructed as SILVIO BERLUSCONI IS DRAG QUEEN. Key words for the intended mappings are ‘parody’, ‘extravagant’, ‘flamboyant’, ‘spectacle’, ‘vanity’, ‘promiscuity’, ‘femininity’, ‘gay’, ‘decadence’ and ‘fake’. The intended function of the metaphor is to mock Silvio Berlusconi by emphasising some of his more negative traits, and by linking him to crossdressing gay performers rather than to politicians. The target domain, former Italian prime minister Silvio Berlusconi, is known for his outgoing character and parties as much as he is known as a statesman, and this is what I wish to emphasise with the metaphor. Drag queens are known to be flamboyant, extravagant and demand quite a lot of the attention available in the room, and the same can be said about Berlusconi – his appearance is sometimes a spectacle in itself. At the same time, drag queens are parodies of some female stereotypes, and many people would probably see them as ‘fake’ women. This element of parody and falsity is also important for my metaphor – Berlusconi is a parody of a politician, it seems at times that he does everything that possibly can be done wrong. Finally, his plastic surgeries and extravagant parties are the motivation for mappings like ‘vanity’, ‘promiscuity’ and ‘decadence’ – it takes quite some time to dress up in drag and drag queens are normally found at festive occasions rather than in Parliament. The metaphor also involves opposition to create a humorous effect. Because Berlusconi is known for his anti-gay and traditional gender role views, comparing him to drag queens, that normally are gender-bending gay men, frames his behaviour as opposite of the gender ideals he advocates himself. This metaphor would be a MP2/hybrid metaphor, according to Forceville’s (1996) categories. Both target and source are depicted, and they are even integrated: Berlusconi is dressed as a drag queen. The metaphor is monomodal, as only the visual mode is used to cue the domains. I have chosen the visual mode, and the medium of photographic collage. The mode makes it possible to emphasise the features I want to map from source to target. The image shows a drag queen that clearly strikes a pose, which might indicate that she is very flamboyant and in the middle of a performance. Her jewels and accessories are also visible, and might emphasise the connotations to vanity. Finally, the colours used, namely red and purple, might carry connotations to both femininity and sexual promiscuity. All this connotations can be inferred fairly quickly because I use the visual mode. If I presented this metaphor verbally, it could have been that I would have to stress the features I wanted to make salient by naming them, and, according to the principle of relevance, the communication would have been less relevant because more processing effort would have been needed to achieve the same cognitive effect. I find this image fairly easy to process if you have some minimal knowledge about Berlusconi and about drag queens. I would further claim that there are some cognitive effects we only get from the visual mode, and not from the ‘same’ metaphor presented verbally. First and foremost, I believe that the image will function humorously, because we see Berlusconi’s face as the face of a drag queen. It is an incongruity from how we are used to see Berlusconi, and hopefully also from the way he would like to present himself. 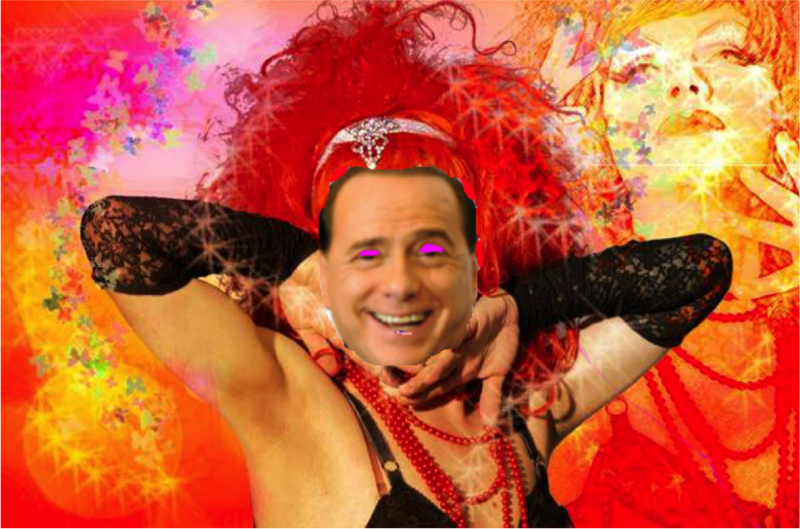 The phrase “Berlusconi is a drag queen” is not really funny. I also think there is some naturalisation effect going on here, because of Berlusconi’s smile: His characteristic smile might resemble the fabulous frown of a performing drag queen, and this visual resemblance might make the conceptual resemblance seem more justified. A verbal instantiation of the metaphor would seem far-fetched, but the visual version seems legit. The smile is also the keyword for my choice of medium: It would of course have been possible to choose the medium of a cartoon, but because the medium of photography might carry connotations like ‘reality’ and ‘proof’, it is a better choice. The naturalisation effect of the smile is thus even bigger: The use of photography shows that Berlusconi actually smiles like this, implicitly, it proves that he smiles like a drag queen. I expected that potential problems in the interpretation could be caused by how familiar the viewer is with drag queens, and with her attitude towards them, and with how familiar the viewer is with Berlusconi and Italian politics. I showed my metaphor to four friends. One of them is more than normally fond of drag queens, and one of them is Italian. Everyone recognised the representation as a drag queen, and three out of four recognised Berlusconi (the one who did not was the one who is very fond of drag queens). Everyone laughed, so my intended humorous effect was achieved. However, it seems that the metaphor largely failed, because most of them did not make sense of the mapping. Some of them named connotations I wanted to map, like extravaganza, but it did not seem like they actually mapped these features from drag queens to Berlusconi. One of my subjects said that she saw mockery, but that it was bad mockery because it did not make any sense and was over the top. The subject that really likes drag queens only named positive connotations like ‘freedom’ and ‘beautiful’. Two of my subjects pointed out a similarity on the conceptual level, namely that Berlusconi can be a diva, and that he is a clown. The latter characterisation came from my Italian subject. It seems like a larger knowledge of Italian politics makes it more easy to make sense of the metaphor. However, she only made one mapping out of the many I predicted. It seems that my metaphor managed to evoke laughter, and everyone understood the over-arching, rhetorical goal of mockery, but I would claim that the metaphor failed because very few mappings were made. It is interesting to discuss why the metaphor failed, because I have to admit that I expected it to succeed, as I think it is both quite resonant and emphatic. A possible explanation is of course the lack of context: This was an experiment where I showed a picture in a sort of 0-context, and it might have been the case that it would succeed if it was presented together with a fitting news report of something Berlusconi had done. An anchoring text might also have been helpful. Furthermore, in real life, no one expects the viewer to explain what they see – they do not verbalise the mappings. As I discussed above, a verbal instantiation of the same metaphor might seem ridiculous, and my subjects might have felt the same when they had to do a verbalisation. In short, presenting a context-less image like this lacks any ecological validity. It is of course also possible that the two domains, drag queens and Berlusconi, do not fit together in a metaphor, even if I predicted it to be both resonant and emphatic. A possible explanation might be that the producer of the metaphor – me – has a cognitive environment that encourages mappings between the two domains. I have lived in Italy, so I know more about Italian politics than the average non-Italian person, and I have a strong interest in theatre, so I might take a performance-perspective on real life events more often. Thus, seeing Berlusconi as a sort of performer might be more easy for me than for other people. This can be an interesting observation, because explanations about how metaphors ‘go wrong’ might give us more insight in the question of how to combine different domains to create a successful metaphor.